251st day of the year. There were then 114 days left in 2018.
on the 36th week of 2018 (using US standard week number calculation). 80th day of Summer. There were 14 days left till Fall. 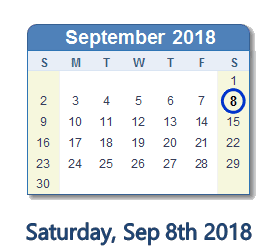 What happened on September 8th 2018? David Brock: I knew Brett Kavanaugh during his years as a Republican operative. Don't let him sit on the Supreme Court.